This index guides you to the lessons on simplybible.com clustered around the topic, “Listen to Jesus”. These lessons are based on some of the great sayings of Jesus. Tap any title next to an arrow in the list below. ➤ Signs of the Times — Jesus chided the religious leaders of his day, because they could read the weather in the sky, but they couldn't see the signs of a different and far more important “storm” building up: a storm of hatred against Jesus God’s Son (Matthew 16:1-4). ➤ In Need of a Physician —When Matthew, a new disciple of Jesus, put on a dinner for the Master, he invited his friends who were all tax gatherers and sinners. The religious leaders of Jesus’s day criticised Jesus for associating with these sinners. Jesus answered that sinners need compassion and a physician (Matthew 9:9-13). ➤ Narrow is the Gate —The parable of the two gates pictures the people of Earth walking on two roads. One is broad and many walk that way. The other is narrow and few find the gate to it. These two roads don't lead to the same place (Matthew 7:13-14). 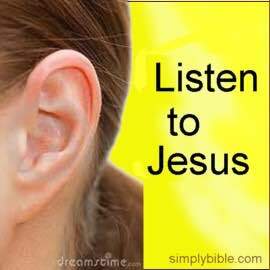 ➤ I Never Knew You —Jesus says something quite astounding: many people call him Lord but he doesn't know them and calls them workers of iniquity (Matthew 7:21-27). ➤ Well Done! Come! —On Judgment day, Jesus will commend and reward the deeds we do for others, and appreciate them as though they were done for him (Matthew 25:23,34,40). ➤ Seek First the Kingdom —Jesus says not to worry about our lives and such things as food and clothing. Rather, seek first God’s kingdom and lay up treasure in heaven (Matthew 6:24-34). ➤ In My Father’s House —Jesus says that he is going back to heaven to prepare a place for his disciples; and that he will come back again to take them there (John 14:1-6). —The kingdom that Jesus established will be taken from earth and into in heaven when its King returns. The gospel of this kingdom includes the belief that Jesus Christ is coming again one day, at the end of the world. He will gather up his spiritual Israel, from among the living and the dead, to take its every citizen into heaven forever. Tap the title above, next to the arrow, to go to that lesson with a link back to this page. —(Colossians). We look at the evidence in Paul’s letter to the Colossians that the kingdom of God now exists and there will not be a future kingdom on earth for 1000 years. Includes “Substance or Shadows?” Tap the title above, next to the arrow, to go to that lesson with a link back to this page.